HILL, Benjamin Harvey, (cousin of Hugh Lawson White Hill), a Representative and a Senator from Georgia; born in Hillsborough, Jasper County, Ga., September 14, 1823; pursued classical studies and graduated from the University of Georgia at Athens in 1844; studied law; admitted to the bar in 1844 and commenced practice in Lagrange, Troup County, Ga.; member, State house of representatives 1851; member, State senate 1859-1860; actively opposed disunion until the secession ordinance had been adopted; delegate to the Confederate Provisional Congress in 1861; senator in the Confederate Congress 1861-1865; arrested at the close of the Civil War and eventually paroled; resumed the practice of law; elected as a Democrat to the Forty-fourth Congress to fill the vacancy caused by the death of Representative-elect Garnett McMillan; reelected to the Forty-fifth Congress and served from May 5, 1875, until his resignation, effective March 3, 1877; elected as a Democrat to the United States Senate and served from March 4, 1877, until his death in Atlanta, Ga., August 16, 1882; chairman, Committee to Audit and Control the Contingent Expense (Forty-sixth Congress); interment in Oakland Cemetery. American National Biography; Dictionary of American Biography; Hill, Benjamin Harvey, Jr. 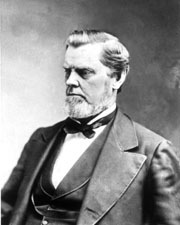 Senator Benjamin Hill of Georgia, His Life, Speeches and Writings. Atlanta: H.C. Hudgkins and Co., 1891; Pearce, Haywood. Benjamin H. Hill, Secession and Reconstruction. Chicago: University of Chicago Press, 1928.